The Northside hosted the Pittsburgh Fringe Festival earlier this year. As expected from preview press nights and word-of-mouth, the Northside proved to be a vibrant, bustling location for this innovative art-filled event. Between the great food and drink from East Ohio Street establishments – including Max’s Tavern, the Park House and Arnold’s Tea Room – and the open-minded people embracing creative happenings and impromptu street exhibitions, any and everyone involved will forever connect the Northside to special memories of their Fringe weekend. What did come as a pleasant surprise was my introduction to the Neu Kirche Contemporary Art Center. Located at 1000 Madison Avenue, this 125-year-old renovated church is quickly becoming a hub of activity with programs ranging from public art and urban regeneration initiatives to residency opportunities and weekly youth yoga classes. To find out more about all the center has to offer, please visit their website at http://neukirche.org/. While you peruse what there is to see online, just know pictures could never do this space justice in both atmosphere and acoustics. 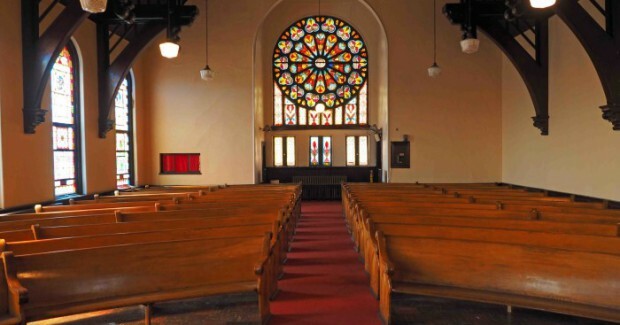 When my Fringe Festival show, Resurrection, was moved to their sanctuary, the gift of presenting while surrounded by stained glass windows and serene silence brought a new level to the piece that could not be matched. 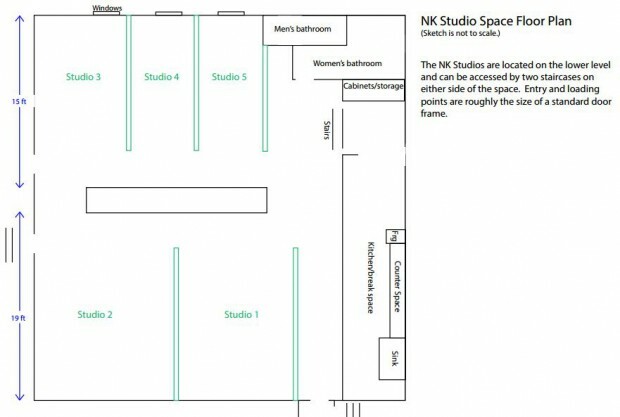 Floor plan of studio space at Neu Kirche. Artists of all disciplines are welcome to apply for studio spaces at the Neu Kirche, while organizations can use other rooms for meetings and events, including the chapel. The staff, Lee Parker, Sarah Keeling and Oreen Cohen, are so inviting and approachable that even the most introverted of creatives can feel at ease with any questions and/or joining any programs of interest. I would strongly suggest signing up on their mailing list to make sure you do not miss the latest and greatest from what is an inspiring Pittsburgh spot for innovative artistic practices. Follow Neu Kirche on Facebook & Twitter @Neu_Kische.